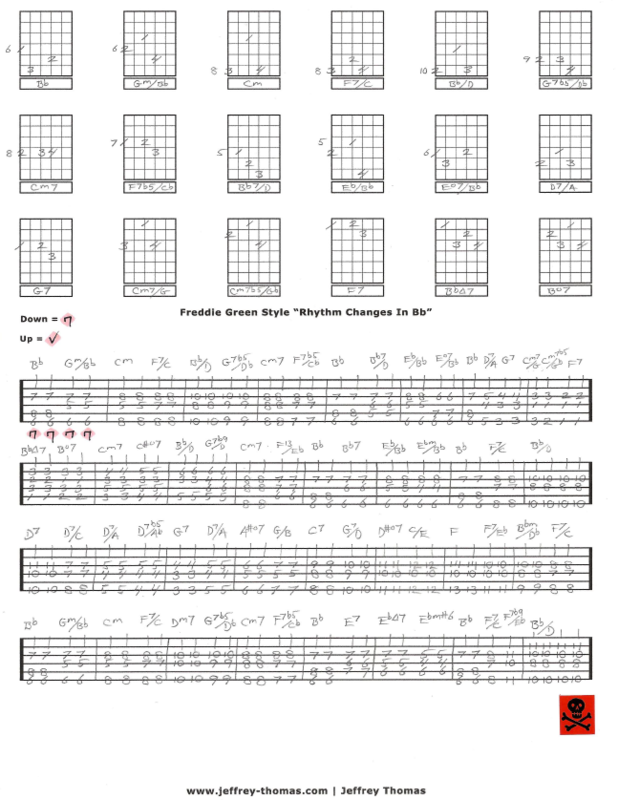 Free jazz guitar tab and video lesson for rhythm changes in Bb. A good mix of traditional and modern chord voicings & substitutions. The basic quarter note “feel” or “Comp” in the Freddie Green style explained and demonstrated as well as some eight notes groove. Good for Big Band, Gypsy Swing or Straight Ahead Jazz of the intermediate to advanced level. Want the full guitar tab for free? Just send in your email address using the form provided. Looking for online jazz guitar lessons? Fill out the Schedule A Free Lesson form to set up a free Skype guitar lesson today! All jazz guitarists should check out Freddie who played great big band style rhythm. Make sure to check out my online video guitar lessons for more cool, unique guitar material.